Recently, someone showed me an article (over 20 years old) written by someone suggesting he was a Christian defending cryonics (sometimes referred to as cryogenics), the practice of deep freezing a person in the hopes of thawing them out at a later time (after a cure for their disease has been developed, etc.). The scientist, as I have come to expect in articles like these, wants there to be no issue between cryonics and the Church and he even went far enough to suggest that a church which raises doubts about it theologically is really no church at all. In defending his thesis, the man turned to all the “good uses” of cryonics, uses which no church should disagree with. His argument was, ostensibly, a pro-life argument. He argued that the church has always been supportive of “extending life” (one of the good uses). To some extent this is true. But the question needs raising, do we endorse extending life to the point of cheating or avoiding death? I have noticed that scientists regularly make this mistake. They posit a positive use in their own minds which should lead all, including the Church, to endorse whatever it is they are endorsing. The problem is that the public imagination doesn’t always see it the same way the scientists do. Ordinary people come to much different conclusions and it’s often these conclusions which concern the Church more. Do people look into cryonics to “extend life” or to “cheat death?” Additionally, where is the line between “Thy will be done” and “My will be done” in such thinking? We see a similar problem in abortion circles. Abortion doctors rationalize their work away under the language of providing choice for women. But few women in a crisis pregnancy who consider abortion do so because they want to exercise a real choice. The fact is they think they have no choice. To a woman in a crisis pregnancy, abortion is not a choice; it is a necessity. Something they are forced to exercise. This is why they ask the questions they ask when they enter the room where the death will take place. (Can/will God ever forgive me)? I’m sure people who work in such clinics can tell quite the tales about the screams, the wailing, the sadness, the shame, the panic of the women who the doctors say are exercising a choice. If that’s all it was to them, I’m sure the screams would never have happened. Science proposes to help mankind in all it does, but in many matters it does more harm than good. The Gospel of Jesus Christ in the forgiveness of sins is the only message I know of which can clean up the messed up lives of women who have been through an abortion. (Christianity cleans up more messes in society than anyone cares to notice). In the case of cryonics, the noble aim of “extending life” is often paired with eugenics, the not so noble aim of creating a superior race or form of human life. 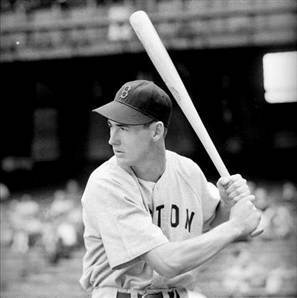 (Ted Williams is a tragic case in point. Will Ted’s frozen head ever produce another super hitter? Such questions have a strangely Hitlerian flair to them). Will cryonics ever really be understood as a medical procedure for the extending of life or will it always be man’s playtoy in avoiding what Christians know is inevitable: death itself? Darwin himself opened the door to eugenics under the excuse that it would be good for humanity. Between Hitler, Stalin, and Chairman Mao, the science of eugenics lies behind the extermination of possibly over 100 million people in the 20th century alone. If cryogenics becomes a toy for people to thumb their nose at God by denying death, then it will never be the force for good I’m sure many scientists want it to be. Ted Williams’ family squabbles after his death demonstrate that cryogenics is already understood this way; as a cheat code on death itself, as a tool for unethical reduplication, as a force, ultimately, for evil. What science ordains as good often is not. What God ordains, on the other hand, is always good. In life, in death, in sickness, in health, in poverty, in riches only one message gives real life and extends it for eternity.